Based on the tech questions that I've gotten from my readers and friends on Facebook and FB Messenger from the first week of April 2018 until today, I'm inclined to believe that Vivo V9, OPPO F7, and the newly announced Asus ZenFone 5 are the three most popular midrange smartphones in the Philippines currently. "Sir Mark, which of these three 2018 mid-level handsets is the best?" "How does Asus ZenFone 5 compare against the Vivo V9 and OPPO F7 in terms of specs? Should I also include it in my list of affordable phones to consider buying?" "Which of this trio has the best rendition of the notch?" If you're one of those who had sent me an inquiry (similar to the ones above) about any of these models, I made this comparison post for you. 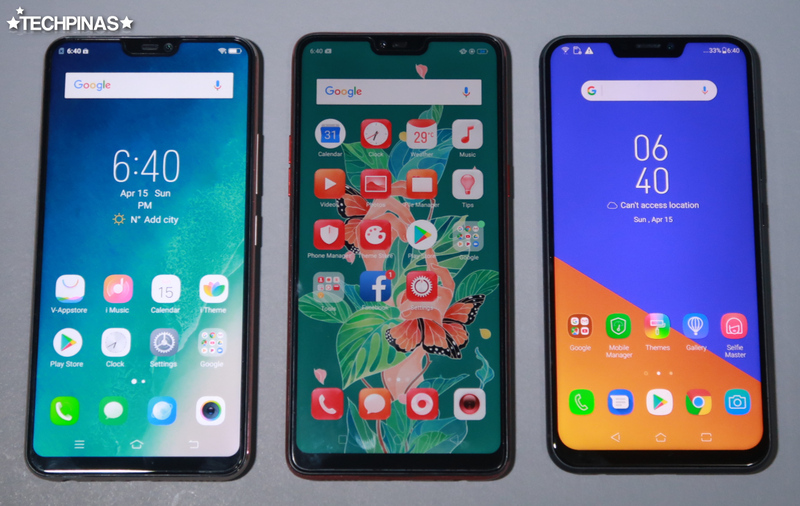 Vivo V9, OPPO F7, and Asus ZenFone 5 2018, respectively. All priced below PHP 20,000 and featuring gorgeous design, good imaging performance, and fairly powerful internal hardware, these fresh devices have instantly captured the fancy of discerning mobile imaging enthusiasts and avid gamers alike who are currently on the look out for a new midrange handset. Alright! Let's start with their looks and construction. As you can see in these images, the three smartphones share more or less similar dimensions. To be specific, Vivo V9 measures 154.8 x 75.1 x 7.9 mm; OPPO F7 comes in at 156 x 75.3 x 7.8 mm; And Asus ZenFone 5 has stats of 153 x 75.7 x 7.9 mm. 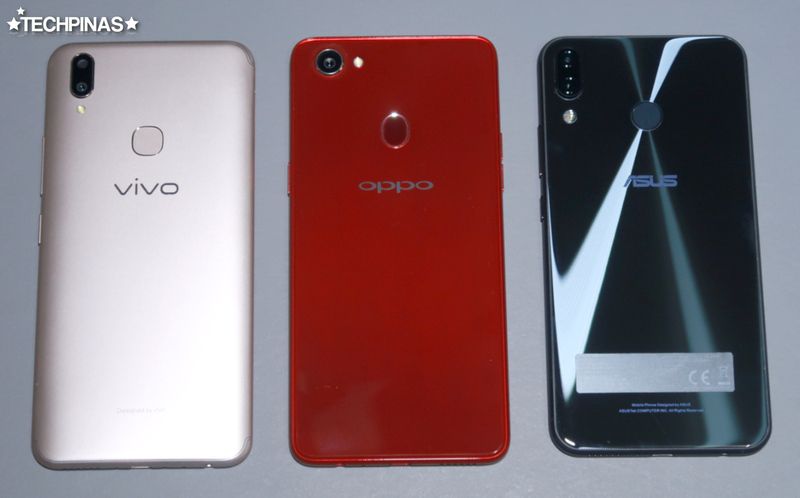 Sure, OPPO F7 is the thinnest; Vivo V9 is the slimmest; and Asus ZF5 is the shortest -- but all not by much. In fact, in terms of aesthetics, the biggest difference between the trio lies in their build -- and this also dictated their notable difference in weight. Vivo V9 has a predominantly polycarbonate shell, which made it the lightest of the bunch, weighing in at just 150 grams. Both OPPO F7 and Asus ZenFone 5 flaunt glass back and front panels but what's interesting is that although the latter has a real metal mid-frame it is lighter at 155 grams compared to the former, which weighs 158 grams. Beauty is subjective so I can't really say for certain which of one is the most visually pleasing. But I guess those who like light phones with metallic sheen would gravitate more towards the Vivo V9 while users who prefer devices that have a glass back panel would be more keen to choose either OPPO F7 and ZF5 in this regard. Vivo V9 is out in two colors: Black and Gold. OPPO F7, on the other hand, is available in Solar Red, Moonlight Silver, and Diamond Black. And finally, Asus ZenFone 5 - replete with that familiar concentric design pattern - comes in Midnight Blue and Meteor Silver. Some people like it, some people don't -- but no one can deny the fact that the notch has become a true novelty marker on today's smartphones. Apple started using it in 2017 and now, practically all global smartphone makers - including Vivo, OPPO, and Asus, have adopted the feature on their own new handset models. All three smartphone that I'm comparing have a notch above their screens. 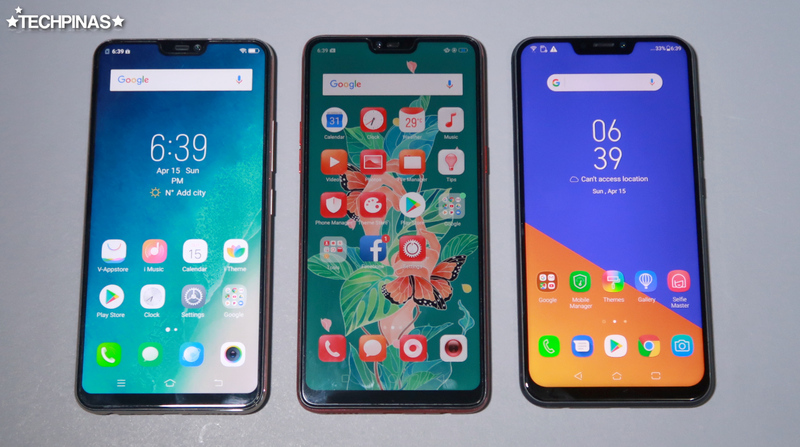 The one on Vivo V9 and OPPO F7 have around the same size - albeit its roughly a millimeter smaller on OPPO's flagship - while Asus ZenFone 5 has the widest. 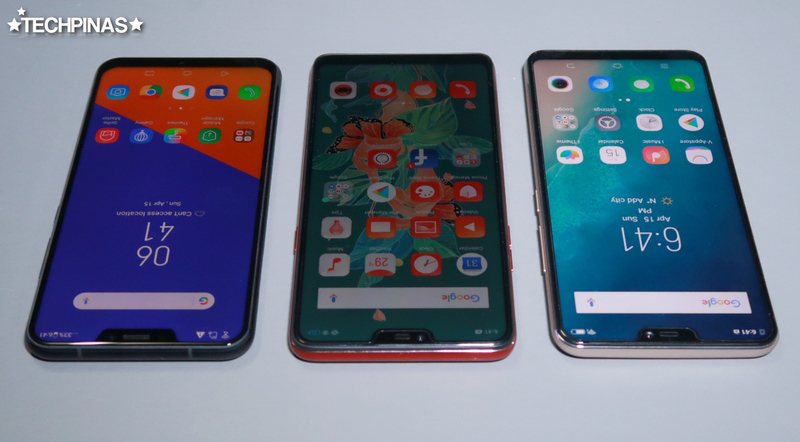 Having played with this trio, I'd say that OPPO is currently leading the pack when it comes to making the notch a useful part of today's smartphones. Why? Well, OPPO F7 has an embedded software that lets you take screengrabs, launch messaging apps, and block notifications just from swiping towards the center of the display in landscape mode from either sides of the notch. This is particularly useful when you're playing games or watching videos on the handset. More: Learn more about OPPO F7 in the Phiippines and watch a demo of OPPO F7's notch software feature. Side by Side Technical Specifications Shoot-Out! 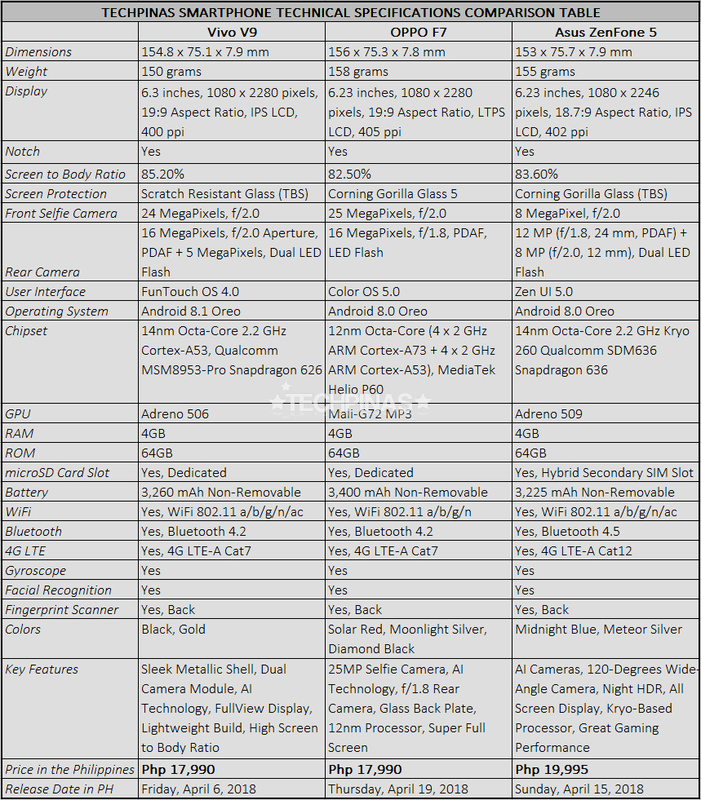 I made this rather meticulous specs comparison table to make it easier for us to spot differences in specs between Vivo V9, OPPO F7, and Asus ZenFone 7 -- whether big or small, inside and out. Let's go through some key specifications one by one and try to see which smartphone wins there. Display - All models sport a tall display (with rounded corners) that covers almost the entirety of their faces. In terms of screen size and screen-to-body, though, Vivo V9 is the winner (if a bit), having an IPS display that measures 6.3 inches across and occupies 85.2% of the device's front panel. LTPS Screen - OPPO F7 has an Low-Temperature Poly-Silicon (LTPS) display compared to the regular In-Plane Switching (IPS) screens of Vivo V9 and Asus ZenFone 5. LTPS and standard IPS displays have more or less the same clarity and brilliance across the board but LTPS screens are known for being more energy-efficient. Selfie Camera - Here, frankly, it's a toss up between OPPO F7 and Vivo V9 as both have advanced AI Beautification Software powering their ultra-high-resolution front-facing cameras. OPPO F7 edges out Vivo V9 by just a bit, though, as the former has a 25MP selfie-shooter compared to the 24MP front-cam of the latter. I know: Just 1 MegaPixel. That said, these two handsets deliver more or less the same quality of selfies across all lighting conditions. Rear Camera - The three models all have something unique about their shooters at the back. The Dual Camera module of Vivo V9 is made for Bokeh; OPPO F7's 16 MP snapper has a wide f/1.8 aperture for enhanced low light performance. But to be completely fair, the best of the bunch is the one on Asus ZenFone 5, which performs well in dim lighting conditions all while being capable of delivering shallow depth of field effect and having a secondary wide-angle optic for capturing landscape or group shots. Stay tuned for my camera shoot-out blog post! Video Recorder - The main rear optics of Vivo V9 and Asus ZenFone are both capable of shooting 4K videos at 30 frames per second. RAM and ROM - It's a virtual tie amongst all three. Users can enjoy the benefits of 4GB of RAM and 64GB of onboard storage from these smartphones. microSD card Slot - The winners here are Vivo V9 and OPPO F7 because they have a dedicated slot for microSD card, which means that the user won't have to sacrifice Dual SIM capability on his or her handset just to get more storage space -- which is not the case for Asus ZenFone 5. Processor - On paper, Asus ZenFone 5's Qualcomm Snapdragon 636 is supposed to be the most powerful of the three chipsets powering these devices. I'd say it's also the best in this bunch in terms of gaming - thanks to its integrated Adreno 509 GPU - and overall performance. Heck, Asus even has an AI Boost Mode that you can turn on while playing games to further enhance the experience. On another note, though, the 12nm MediaTek Helio P60 chip of OPPO F7 is currently being praised for its energy efficiency. UPDATE: Interestingly enough, just this morning, I got a result of 139,255 when I ran Antutu Benchmark on my OPPO F7, which is clearly higher than the 135,250 that I got on my Asus ZenFone 5 in AI Boost Mode. I guess I'll just have to run the test a few times on both smartphones again to check variance in results. Stay tuned for a separate post on this. Privacy and Security - In terms of unlocking methods, which include Fingerprint Scanner and Facial Recognition, all of these smartphones have the same set -- so again, it's a tie. I have to note though that Face Unlock using both Vivo V9 and OPPO F7 is very snappy and reliable. Battery Size and Uptime - The clear winner here is OPPO F7 with its 3,400 mAh battery pack plus its power-efficient 12nm processor and LTPS display. That said, the two other models are no push-overs in terms of uptime. In fact, all three come with advanced Power Saving features to greatly boost battery life. Charging Port - USB Type C, which Asus ZenFone 5 has, is faster than microUSB 2.0 port both in charging and data transfer. Price - Asus ZenFone 5 is the most expensive of the trio at Php 19,995. Hence, it's a tie between Vivo V9 and OPPO F7, which don the same official suggested retail price of Php 17,990 here in the Philippines. So which is the overall winner among these three powerful 2018 midrange smartphones? In all honesty, it's hard to say which one is the best because all of them have strengths or qualities that can match the requirements of individual consumers. If affordable price and great selfie-imaging performance are your top considerations, Vivo V9 and OPPO F7 would be perfect for you. If you want a glass-metal-glass smartphone with useful rear-camera features plus powerful internal hardware for gaming - and you don't mind spending a bit more on it, check out the Asus ZenFone 5. Do you want a new handset with stunning glass back plate, eye-catching color options, wallet-friendly price, and long battery life? You should definitely check out OPPO F7 and strongly consider getting it. Looking for a light smartphone with a large display with extremely thin bezels? Vivo V9 is probably the best option for you this year, across all price points. Anyway, my point is, you can't go wrong picking any of these three to be your new mid-level beast of a handset in 2018. For me, all of them are amazing and incredible in their own regard. But that's just my opinion, let me know your thoughts about these three popular midrange smartphones via our comments section below. Let's talk!